If you use your iPad primarily for reading news and playing games, you're certainly not alone. Facebook definitely realizes that, which is why the social network has updated its iPad app with a new right-hand column (which only appears in landscape mode) that highlights those areas of interest -- news and games -- along with other features that'll hopefully make the app more useful for users of Apple's tablet. Especially of note is a new sidebar module called Trending Articles, which surfaces articles from sources that are relevant to you; either they're related to pages or friends you follow, the city you live in, your favorite sports team or simply news sources you've "liked" on Facebook. We had a chance to take a look at an early demo of the updated app, and the Trending Articles section looks almost like a miniaturized news portal. It consists of four different sections, which you can switch between by swiping left or right. In the example we saw, one section displayed articles from the New York Times, another from Buzzfeed and another from NPR. The fourth section showed stories about the Pittsburgh Steelers, with the articles coming from different news sources. Of course, the articles you see will be different depending on your own interests and preferences. "It's showing articles that are popular over the past day or so," says Chris Struhar, the product manager for Facebook for iPad. "Ideally every day you're going to come to this and see a fresh batch of content. We try to rank them and find ones that you engage with most." The other key part of the new sidebar is a section that showcases games that are popular in your network. If any of them look interesting to you, you can tap the Play Now button to be brought to the App Store so you can download it. There's also a My Games section that simply shows you what games you're playing so that you can easily jump back to them. These features, along with the birthday and event reminders and Trending Topics module, were already rolled out as a test earlier this year, but is now finally in the official app. A Trending Videos section didn't make the cut, but there's a possibility of that being added in the future. And if you're worried about your chat list disappearing from the right rail, don't worry -- that's one feature of the old sidebar that's still there. So why change things up like this? Well, Struhar says that it came down to looking at what people were doing on different interfaces. "We see that people are using the iPad more in the evenings, more to consume media, more to play games," he says. 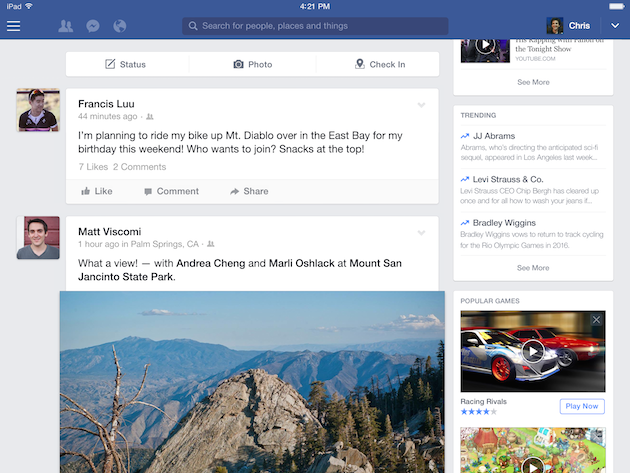 "We wanted to take the essence of Facebook and build a right version for that specific interface." The idea here is that the use case for the iPad is very different from a phone and from the desktop. Yet, the experience on an iPad doesn't seem terribly different versus an Android tablet, at least at first glance. When asked about that, Struhar says that they're in the process of looking at Android. "We're trying to understand how similar or dissimilar they are to iPads ... This interface would make a lot of sense on Android tablets, and it's something that we're considering." Until then, however, it's only iPad users who are able to take advantage of the new sidebar. So if that applies to you, you can go ahead and hit that Update button, because it should roll out starting today.